Successful results from two more face transplants will speed progress towards similar operations in other countries, say experts. The Lancet journal reported operations involving a bear attack victim in China, and a French patient with a massive facial tumour had taken place. 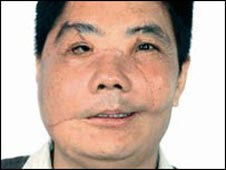 The Chinese patient was given not just the lip, nose, skin and muscle from a donor, but even some facial bone. Specialists in London are working towards the UK's first transplant. Frenchwoman Isabel Dinoire became the world's first face transplant patient in 2005 after being savaged by a pet dog. She described the results of the operation as a "miracle". The latest operations were just as complex, but involved different challenges for French and Chinese surgeons. The first operation took place in April 2006. The patient was a farmer from a remote village in Yunnan province in China, who had been attacked by a bear 18 months earlier, leaving a huge section of tissue missing from the right side of his face. The operation, at Xijing Hospital in Xi'an City, used the face of a 25-year-old man who had died in a traffic accident. Despite immune-suppressing treatment, the patient had to battle his body's attempt to reject the new tissue on three occasions. His doctors said they now believed that face transplantation was a viable long-term option. The second operation, carried out in Paris in January 2007, involved a 29-year-old man disfigured by a neurofibroma, a massive tumour growing on his facial nerves. Its removal was timed to coincide with a face transplant, and a year later, doctors again declared the operation a success. The patient told them that previously he had been considered a "monster", but now felt like an anonymous person in the crowd. The procedure, they said, had moved "from ethical debate to surgical reality". In the UK, surgeons at the Royal Free Hospital in London are making preparations to carry out the operation if the right combination of patient and donor becomes available. Professor Iain Hutchison, a consultant oral and maxillofacial surgeon at Barts and the London Hospital, and founder of the "Saving Faces" charity, said that the twin successes would offer more encouragement for surgical teams considering carrying out their own operations. He said: "This takes a step forward in two ways - firstly the use of bone as well as skin - and next is carrying out this operation on someone with a benign tumour. "There will always be limitations to this - the main one would be a societal constraint - a lack of suitable donors. "However, there is certainly demand for this, with the major area being for people with facial burns." Roger Green, president of the British Association of Plastic, Reconstructive and Aesthetic Surgeons, said: "This particular surgery is a way of giving back a life to a patient who has been horribly scarred by burns, trauma or a tumour. "However, we must acknowledge the long-term medical risks, such as transplant rejection and the need for life-long medication, associated with the procedure. There is also the potential of psychological impact following such a transplant."